Teaching scripture and poetry to children is one of the simplest ways to instill truth, expand their minds and vocabulary, and increase their appreciation for the beauty of language. Children memorize at an almost alarming rate. I want to take advantage of this ability while they’re little. The problem with memorization is, if you don’t keep reviewing, you’re almost guaranteed to forget. After teaching the children a poem until they could recite it flawlessly, only to have them stumbling over the first line a month later, I knew something had to change. That’s where the poetry jar comes in. After we learn a new passage or poem, the title goes into the poetry mug. Each school day, the children get to pick a slip of paper and recite the passage they picked. There’s something about the element of suspense that makes them just love our review time. Now we’re not spending time learning new poetry only to have them forget what we already learned. 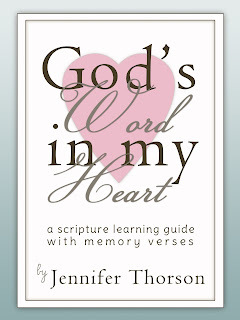 My friend Jenn, from The Purposeful Mom, compiled a lovely resource for Scripture Memory, God’s Word in My Heart. What are your favorite kids’ poems? There are few gifts a mother can give her child that are as precious as the gift of Scripture memory. When I was little, my mother spent countless hours teaching my siblings and me verses and whole chapters from the Bible. As we grew older, she and my dad stressed the blessing of learning Scripture by heart. We sang verses put to music, memorized passages together, and were encouraged to memorize on our own. Many years later, those passages I learned as a child still run through my mind to encourage me, guide me, and teach me. Now that I have children of my own, I am so excited to get to teach them the Scriptures. God’s Word in My Heart is a Scripture learning guide. In the first part of the ebook, Jenn shares the importance of teaching Scriptures to our children and then gives some excellent (and fun!) ways to teach verses to our children. She had quite a few great ideas that were new to me and help really enforce the memory work in the hearts and minds of little ones while making it enjoyable. The second part of the ebook is an ABC collection of specially selected Bible verses and additional verses on sin and justification. I love that Jenn offers three different versions: KJV, NASB, and a “variety-pack”, to meet the needs of different families. Underneath each verse there are three checkboxes, for, as we all know, being able to recite a verse right after you’ve learned it is great, but if you don’t review it, you’re likely to not remember it days, months or years down the road. 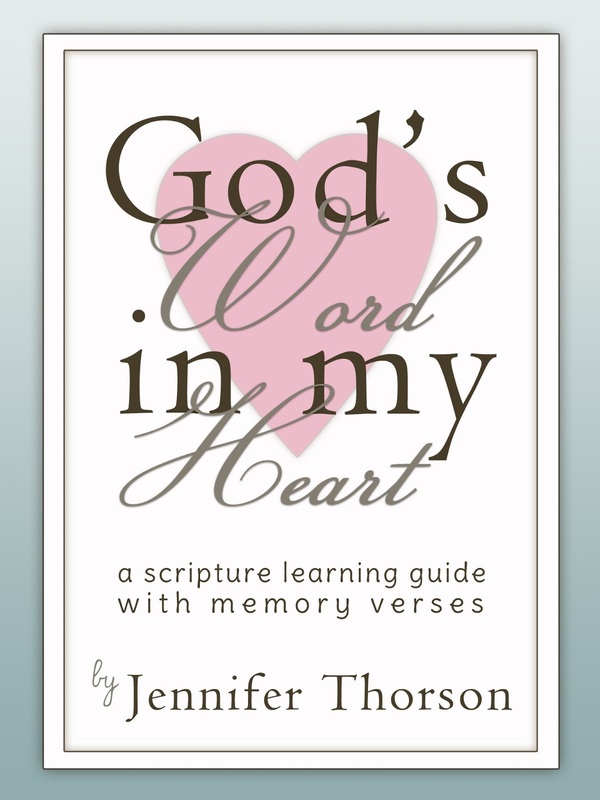 God’s Word in My Heart is $3.99 but as a special introductory price, you can purchase Jenn’s ebook for only $1.99 through the end of today. Plus, she’s also offered two of my readers the chance to win a copy! Just enter the form below. Motherhood is a refining process. So is teaching. Our homeschool journey is just beginning and already we’ve had our ups and downs. Some days I wonder if there are more lessons for the new homeschool mom than the students. Six months in to our first year, here are six lessons I’ve learned. One day, as Rose (5) and I were reviewing a poem she had learned, Will (3) asked, “Can I say it now?” I listened dumbfounded as he quoted the poem flawlessly. He had never even seemed to be listening! Children soak up information! Don’t underestimate them. Meals are important. Cultures are shaped around the table. Make the most of meals. For us, this means reading the Bible at the breakfast table. The kids take (much) longer to eat than I do. I’m often tempted to jump up and get a head start on dishes and laundry. Taking the time to linger at the table and read them a chapter or two from the Bible is much more important. The children love it and so do I. Not only does it ensure that we get to this most important part of our homeschool, starting off our day in the Word makes it much better! Phonics, writing, literature, history. I’ve eagerly anticipated teaching my children these subjects. Science and math, not so much. But after some wonderful encouragement from an older mom, science is one of my favorite parts of kindergarten. Want to know what she said? Stop stressing about having a perfect plan (at least with your kindergartener!) Take nature walks, explore Creation, look up facts about things that interest you, and read books about God’s world. We have all learned so much… and had lots of fun in the process. I really wanted to be one of those homeschool moms who researches curricula, finds a good option, and then sticks to it through ups and downs. Rose and I started a highly-recommended phonics program and didn’t have many ups. We both started to dread phonics. Finally I realized I was just being stubborn. It was time to find something that worked for us. We started Phonics Pathways and haven’t looked back. Now we’re both enjoying phonics again. I want to be diligent in what we start, but when you’re grinding your gears day in and day out, it’s time to shift. As my journey as a homeschool mom begins, I am learning to focus on my priorities, not underestimate little ones, make mealtimes meaningful, be open-minded about new subjects, do the hard subjects first, and give myself grace if we need to change tactics along the way. Do you homeschool? If so, what have you learned along the way?